Primitive Patriotic Americana Saltbox Flag Hand Painted Vintage Hanging Book. 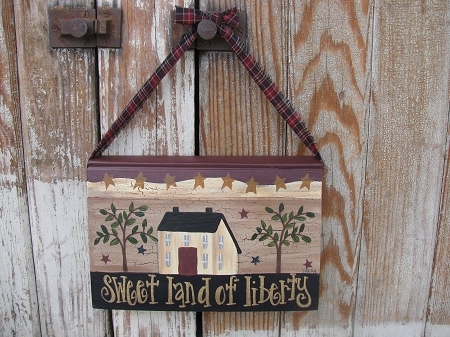 Hand painted on a vintage book is a neat new saltbox hanging book for the summer months or your Americana themed room! Painted with a burgundy and cream stripe pattern to the top, to symbolize the stripes of our flag with Mustard colored stars over top. The middle section is a crackled khaki tan colored background with a cream saltbox house, 2 trees and tiny Dark Navy and Burgundy stars around. The bottom section is a dark navy blue. This part you can customize with your favorite saying from the choices listed. These painted books are perfect to hang on peg shelves, door knobs, cabinets, chairs and more. Each book has been repurposed antique books, Average size is 8"x5" but will vary slightly. You can pick out your favorite saying for the bottom section. Hand painted, designed and signed by Heidi.